The NACHC conference provided an opportunity to interact with other providers in a multidisciplinary directed approach. The presenter learned and shared ideas to improve the health of complex patient populations. Her presentation focused on how the integration of clinical pharmacy services into a federally qualified health center can help to improve access and health outcomes for patients with diabetes. The presenter had positive dialogue with other meeting attendees regarding benefits of clinical pharmacy service integration. She was also able to speak with other pharmacist teams to learn about other models of integrating pharmacists into patient care teams to improve the care of patients. The ADA disparities conference was an opportunity to learn about and share ideas to improve the health of diverse populations impacted by diabetes. 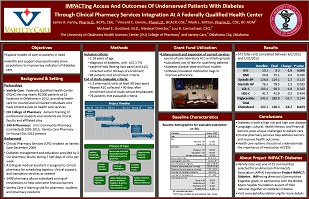 Variety Care presented on the improved access and health outcomes for patients with diabetes that results from integrating clinical pharmacy services into a federally qualified health center. The presenter had positive dialogue with other meeting attendees regarding benefits of clinical pharmacy service integration and also learned about different models to address health needs of disparate populations.